This Summer, Filthy Fanny's the cocktail bar in the Crown and Shuttle pub at 226 Shoreditch High Street, is turning it's back yard into a summer beach bar, with cocktails, gourmet street food, ice cream and more. It opens with a bang on Weds 24th May, and will then be open daily after that (normal pub hours) for the summer. 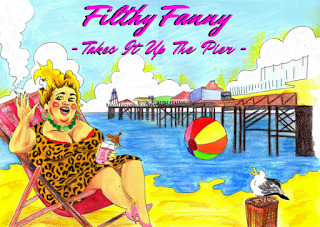 "Get ready for a summer of kiss me quick fun as Filthy Fanny Takes it up the Pier. Launching on May 24th we will be bringing out the bingo to celebrate and with half price cocktails on offer, seaside ice cream, a cheeky bit of rock and plenty of sunshine (probably). Fanny is getting you fully prepped ahead of the bank holiday shenanigans so seas the day and take yourself from Clapton to Clacton with Filthy Fanny as she takes it up the pier!"